A new report, Feeding The World Without GMOs , by the Environmental Working Group (EWG) refutes the corporate biotech/industrial narrative that genetically modified organism (GMO) foods offer real solutions to global hunger and food insecurity. Despite significant progress over the past 30 years, the world still faces an ongoing crisis of hunger and food insecurity. 805 million people continue to go hungry, according to estimates by the Food and Agriculture Organization of the United Nations. The world also faces a “hidden hunger” problem —micronutrient deficiency—which affects some two billion people, causing long-term, irreversible health effects and significantly impairing economic productivity. We face stark challenges posed by population growth: by 2050 the demand for food will be twice what it was in 2005. Feeding the World Without GMOs takes a hard look at ways to address this problem and concludes that GMO food is a non-solution. In nine pages of tight synthesis, it analyzes: (1) why GE crops don’t contribute to food security; (2) what would work to boost the global food supply; and (3) the unfulfilled promise of genetic engineering. A recent bulletin from the Southern Education Foundation reports that, for the first time in fifty years, a majority of students in US public schools come from low-income families. The data, collected for the 2012–13 school year, considers a family low income on the basis of whether the children register for the federal program that provides free and reduced-price lunches to students. Figures show that 51% of students in US public schools, ranging from pre-kindergarten through the twelfth grade, were eligible for the lunch program. While poor students are spread across the US, the highest rates of poor and low-income families are concentrated in the Southern and Western states. In twenty-one states, at least half the public school children were eligible for free and reduced-price lunches. In Mississippi, more than 70% of students were from low-income families. In Illinois, 50%—one of every two students—were low-income. While the United States proclaims itself the land of limitless opportunity, the shining “nation on a hill” where dreams of prosperity and success become true, the reality on the ground often belies this pastel rhetoric. The reason for this failure is not lack of resources but policies determined by voodoo economics and rabid cruelty. Too many people are unemployed or underemployed. Too many workers are earning poverty-level wages. Too many programs that provide critical assistance to the neediest of our fellow citizens are being cut. Yet the big shots in Congress, who lecture the poor about the need to work hard, still subscribe to the belief that cutting taxes for the rich and granting subsidies to big business will result in rising incomes for everyone else. One of the most effective measures in assessing a country’s real economic health is the extent of food insecurity among its population. Figures from reliable sources indicate that a shocking number of Americans perpetually live in the shadows of hunger. Over 46 million Americans–roughly 1 in 7 people–are dependent on SNAP, the food stamps program, which has been in the crossfires of a radically regressive Congress. If funding for the program is cut still further, the number of SNAP recipients will go down while the number of people unable to obtain sufficient food will rise. 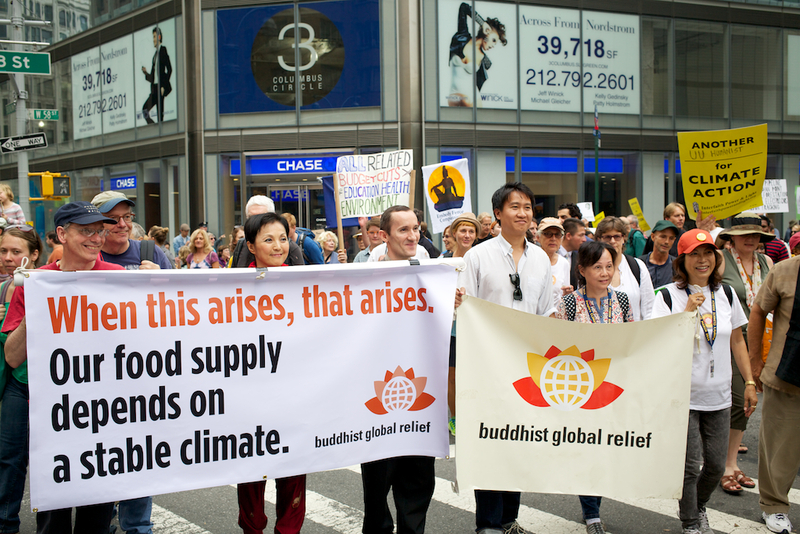 This past Sunday, Buddhist Global Relief joined 400,000 others at the People’s Climate March in New York to demand swift action to halt the threat of global climate change. The streets were filled with marchers as far as the eye could see with young and old, rich and poor, of all races and religions, joined by their common humanity. Buddhist Global Relief was part of an Interfaith contingent of thousands that packed 58th Street between 8th and 9th Avenues so tightly there was barely room to breathe. 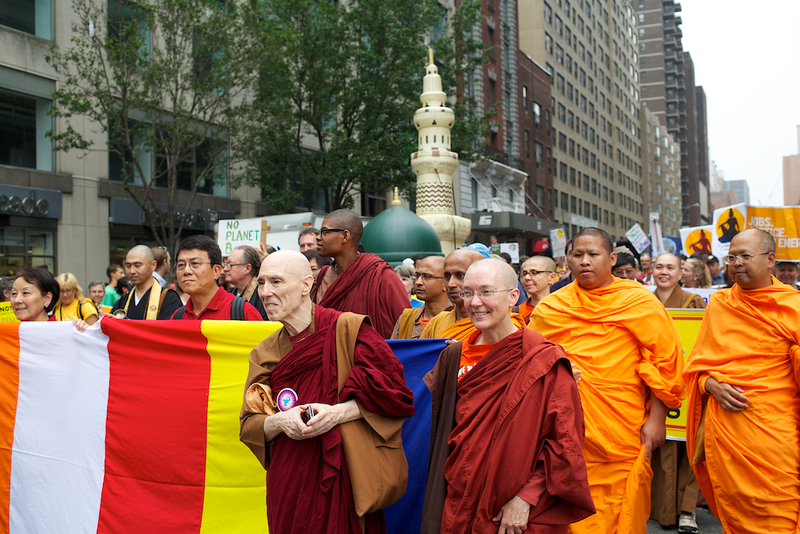 Joining us were more than twenty other Buddhist groups in the common cause of compassion and concern for the world. Among the many things that the Buddhist principle of conditionality teaches us, three are particularly pertinent to any endeavor to diagnose and alleviate suffering on a global scale. The first is that events and processes that appear remote and disconnected from one another may be intimately connected through subtle chains of influence operating subliminally across the systems that generate them. The second is that conditions that appear slight and insignificant on their own can converge to produce effects massive in their impact. The third is that human volition is an important factor in the web of conditions and can thus transform even processes driven by the weight of physical laws.